The Arrivals – During most contests, pilots and crews arrive a day or two early to set up and take advantage of an extra day of flying before the official practice period. 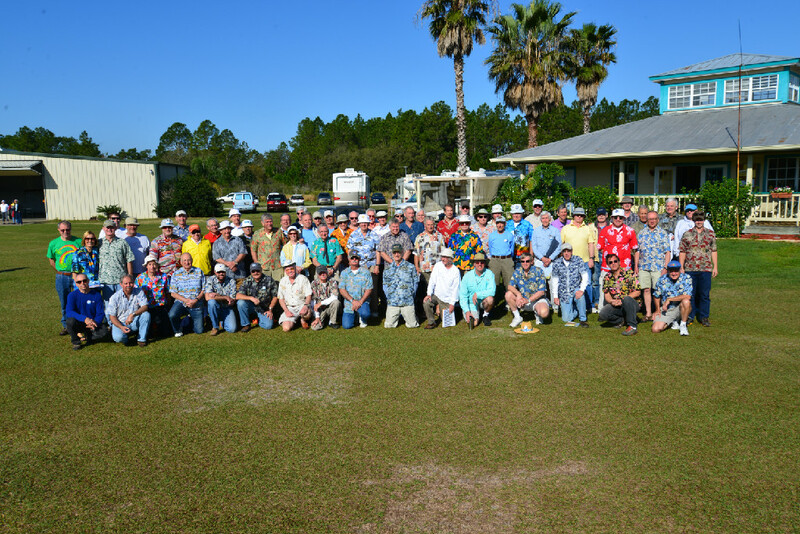 If you have ever been at “The Seniors”, you would notice contestants start showing up in January to enjoy the good winter weather in Central Florida. Of course we do have our Canadian snowbird influx which smartly arrive in October and depart Florida in April to attend the Perry contest. Week after week we celebrate the new arrivals as the cook outs and parties around the RV park grow larger. 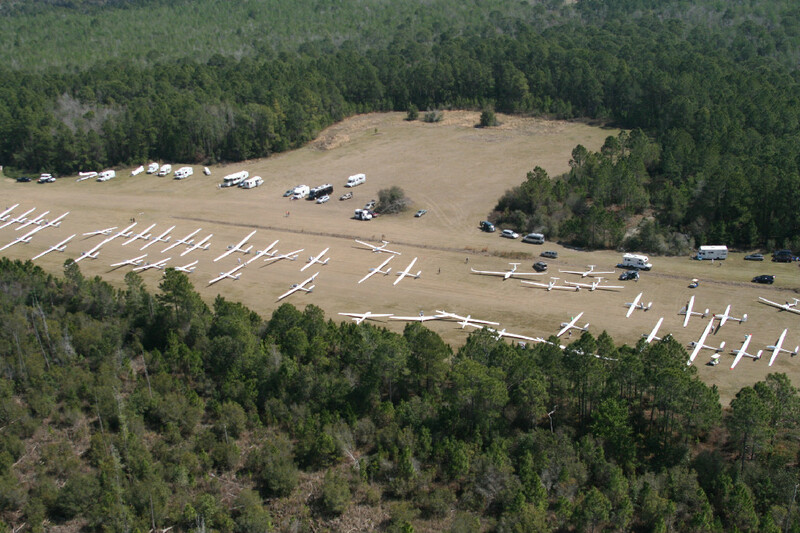 On every good flying day, tasks are called on the local Seminole-Lake cross-country frequency. Join us if you like or just enjoy the great flying and know you have other pilots looking out for you if trouble arrives. The weather four weeks prior to the contest was a parade of cold fronts with very little flying being accomplished. Our usual high pressure area over Central Florida, which would normally keep all the fronts well to the north of Orlando, was missing this year. Then everything changed as the majority of contestants arrived on site. They were treated to highs in the mid to upper 70’s with a very dry airmass sometimes referred to as very blue conditions. The Contestants – “The Seniors” started almost 25 years ago when Tom Knauff and Charlie Spratt talked about a “fun” contest for seniors. 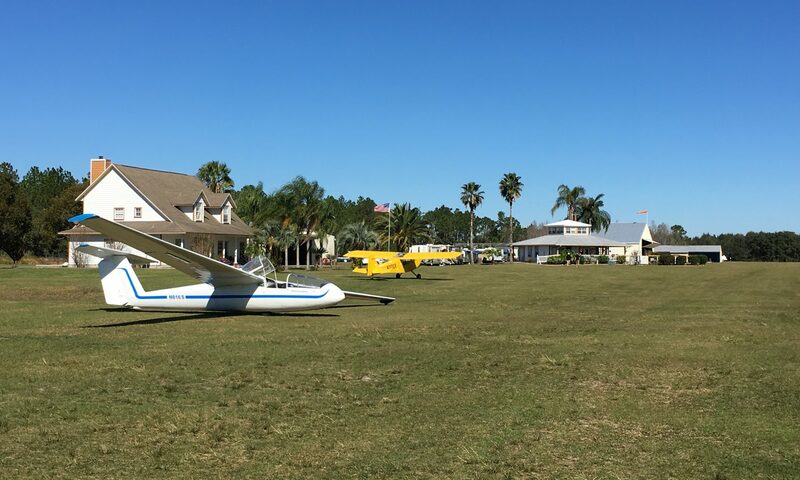 Tom and Doris had flown in Florida during the winter months for years and knew other soaring pilots would love it too. “The Seniors” would be a time for good friends to get together and enjoy each other’s company in a competitive soaring vacation. Knut Kjenslie offered to host the contest at Seminole-Lake and a list of rules were established to promote the event. One rule was a pilot received a penalty if they finished faster than the oldest competitor in the field. Another was the minimum age to compete as a regular entry was 55 years old or one year older than Karl Striedieck and this was a sliding scale, adjusted every year. This year we decided to invite a top junior pilot to race as a guest and to learn from some of the greats in the sport. Jim “JP” Stewart (X8) joined us this year and had a great experience. Mihai Tanjala, the owner of Seminole-Lake Gliderport and our host, offered this invitation and paid for most of JP’s entry. Our contestants travel from all over the US, Canada and even Belgium. The most traveled pilot for this contest actually lives in Texas. He had to withdraw before the contest due to an accident involving his sister back home. He traveled back to Texas and discovered his sister had recovered better than expected and decided to return to Florida. Thanks Tom McKnight for being the ironman of the highway! The Captain for the Belgium Soaring Team, Baude Litt, flew in for the “Seniors” and Perry. The quality of our contestants is evident when you consider that last year we had 27 former National Champions in the field. Everyone who races and wants to get better usually puts “The Seniors” on their racing calendar early. This year we had 82 entries for only 55 regular entries and 5 guest slots. The Contest – Everything was ready when the pilots arrived in the DG hangar for the start of the first pilot’s meeting. After a uniquely military change of command between our Co-Contest Managers, Rich Owen and Virginia Thompson, Virginia commenced the contest festivities as I took my seat as just one of the pilots. Our CD, John Good, keep the meeting interesting, cataloging most of the mistakes pilots have made in the past 23 years of this contest. From a gear up landing on the last day, last landing of the contest, last year to pilots asking for aero retrieves from airports miles away from they were actually located, John encouraged us to learn from past experiences. Fernando Silva briefed us on the weather wearing a bright blue shirt devoid of any white. This was to be a pattern as Fernando’s shirt would signify the type of day we were to experience. Blue conditions with 3 kt climbs to 5,000’ were expected later in the day. The day took longer than expected to get cooking so a 2 hour TAT was called encompassing Frostproof and Green Swamp to the south and Flying Baron to the north. The 56 competitors were launched by the efficient ground crew in just one hour and the contest was underway. The early part of the day was weaker and those starting late were treated to better conditions. 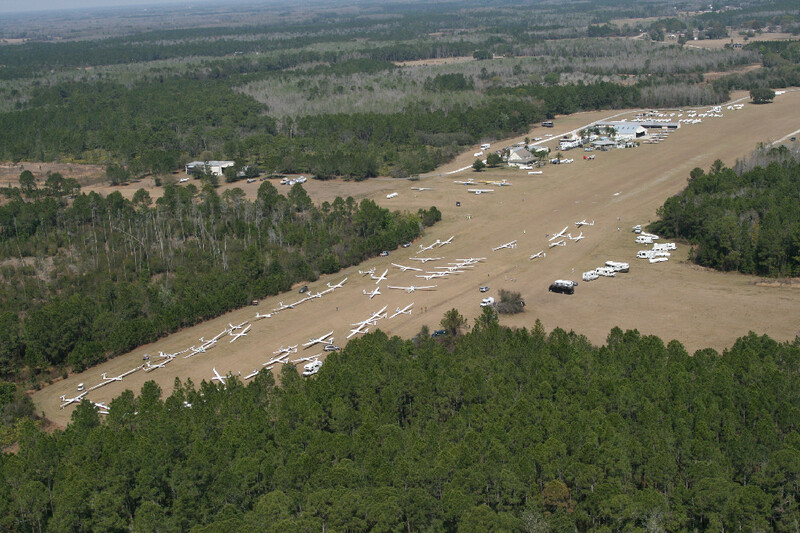 The lift around Green Swamp was weak and several pilots got a closer look at the airfield before continuing on. Henry Retting (R) avoided all the traps and flew around the course taking the day in first place. Greg Shugg (1 ST), another Florida boy finished second in a Standard Cirrus showing you do not need a new shiny ship to fly well. Ken Sorenson (KM) flew the farthest for the day, finishing third just .84 mph (handicapped) behind Henry. The next day our weatherman was wearing a blue shirt with white stripes teasing us with the probability of cu. Alas, Fernando dashed our hopes when the dreaded prediction of high cirrus was to make their appearance early in the day. The CD was ever hopeful and the grid was ready when the cirrus arrived. It looked like we were going to fly for a short period when the cirrus abated, but the heating just never got good enough to launch. The day was cancelled but several pilots flew for fun and validated the CD’s call on their return. Karl Striedieck was one of the pilots who flew that day not wanting to disappoint his backseater. Victor Hugo wrote an interesting article you can read on Soaring Café that chronicled his flight with Karl. The contest day 2 weather brief predicted a good airmass but with less solar heating than a soaring pilot could wish for. Thick morning fog significantly restricted early heating but by 10:00 AM visibility improved and so did our hopes. Dave Nadler, our long time sniffer at the Seniors, was again pressed into service because of his electric self-launch Antares and his skills in weak conditions. After grinding around in half knot thermals for most of the early afternoon, the launch commenced without a single relight. The task opened very late at 3:44 PM but conditions allowed a majority of pilots to complete the task, albeit at modest speeds. Locals Rich Owen (FA) and Jim Lee (BL) finished first and second with Karl Striedieck (KS) placing in third. Sixteen pilots failed to complete the task with most finding one of the many airfields throughout the contest task area. All pilots reported safe landings. According to the rules of “The Seniors”, a crew day is mandatory so our team members can enjoy some of the other attractions that are present in the Orlando area. Many had trips planned to Disney World, Universal, Kennedy Space Center, Fantasy of Flight museum, or just a simple day taking in downtown historic Mount Dora. Unfortunately the rest day coincided with rain, wind and low clouds much to the enjoyment of the pilots. Crews on the other hand were planning to get back at their pilots for the lost opportunity to have some fun. During this evening an event was held to show support for the US Soaring Team. Captains Dennis Linnekinn and Fernando Silva gave a presentation on what the Team was doing to prepare for this year’s World Gliding Championships. The highlight of the night was Dennis’ singing of the Canadian National anthem to thank our own Virginia Thompson for her support of the US Team fundraising efforts. For those of you who do not know Virginia, she is a Canadian and her other half (not better) is Dave Springford, a multiple time Canadian Soaring Team member. On contest day 3, post cold front weather persisted. Gusty northwest winds, cold temperatures, and low, broken and severely blue thermals were the conditions for the day. Conventional wisdom says that gliders cannot possibly fly cross-country in these conditions, but having spent the previous day on the ground we decided to try anyway. We needed temperatures to reach the high end of what was possible, while the winds would need to be at the low end of forecasted levels. John Good called a short 1.5 hr TAT over an area that had good landing spots and a bounty of airfields. Nowhere in the state of Florida was a single scrap of cumulus seen that might help indicate lift. We started the day with 20-25 kt winds at altitude but these subsided to 12 kts by the time the ships were homeward bound. On this blue day we had 3 kt climbs to 4,000’ but most pilots spent some time below 2k. Ken Sorenson (KM) showed us why practicing in windy Texas conditions is good training for today by winning the day. Steve Arndt (S2A) finished second with Greg Shugg (1ST) in third. With two days remaining the weather forecast seemed to be on the optimistic trend. After five days of struggle with blue, weak, difficult conditions, we felt entitled to some low stress soaring. Fernando Silva gave the forecast of beautiful cu, strong climbs to over 5,000’ and predicted the winning speed on the number! John Good called a 2 hr 45 min TAT that took the pilots south. The drag race was on down Hwy 27 towards Avon Park. Most of the top of the score sheet went deep into the first circle, almost to Sebring Florida. This decision paid off as conditions were better than forecasted and speeds soared. A number of pilots failed to realize this in time and finished under the minimum time. Ken Sorenson (KM) again won the day with a flawless flight of 191 miles at 68.3 mph. During “The Seniors”, the level of competition is so great that we almost never have anyone win two days during the contest. Karl Striedieck (KS) was a close second but took over the overall lead at the top. The last day of the contest was at hand and the weather forecast was for even better conditions. There was talk for a “banquet task” but that was very short lived. We are here to race and race we did. John called a 3 hour task that covered a good part of Florida. On the run to the first turnpoint, some of the competitors saw “The Swamp”, the football stadium of the University of Florida in Gainesville. Good cu marked the lift but finding the fastest energy lines was key to winning the day. Heading towards the last turnpoint, pilots were able to follow a good street that enabled them to cruise without turning for at least 20 minutes! Conditions were so good we had a number of pilots finish under time. Everyone had a great flight and now it was time to celebrate at The Mission Inn and Golf Resort. It is tradition at “The Seniors”, that scores are not revealed until the banquet awards ceremony after dinner. The anxious pilots arrived at the dinner location to be greeted with a setting sun over the lake, a fire in the pit and a pig being roasted outdoors. After a great dinner, some wine and beer, the festivities began. Our Co-Contest Managers, Rich and Virginia again teamed up to present the awards. We first had to present the Uf-Dah award for the largest single OMG moment during the contest. This year we had so many that we included the audience to participate. One nominee was our CD, John Good, for leaving the clubhouse and locking up. Unfortunately, someone was in the bathroom in the clubhouse and you need a key to unlock the door from the inside. John was bested by a pilot who landed out and when asked where he was by the retrieve desk, gave them a zip code to help locate him! Daily winners for the final day of the contest were – in third place, Henry Retting (R); in second place was Ken Sorenson (KM), and in first place with a handicapped speed of 68.10 mph was Bob Salvo (RS). Bob received a standing ovation from the entire crowd. He was so emotional he could barely speak. The trophies for the contest are beautiful etched crystal glass mounted on a wood base and are presented to the top three competitors in the contest. The winners of the 2014 Senior Soaring Championship was in third place, Henry Retting (R), in second place Rich Owen (FA), and for the second year in a row, Karl Striedieck (KS). Karl has won the Senior Soaring Championship a total of 7 times. Now you know why the originators of “The Seniors” proposed the special rule regarding minimum age for a regular contest entry. If you have ever been involved in the management of a contest, you know the success of the event is based on volunteers. These are the people that give up vacation, personal time, and sometimes school to help run the event. 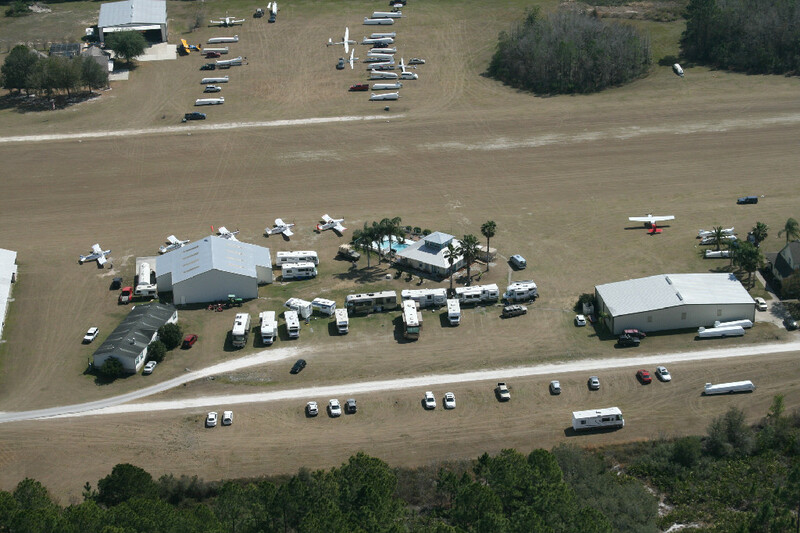 The entire Seminole-Lake staff, all our local pilots and their wives, and the competitors that were kind enough to say “what can I do to help”, Virginia and I want to thank you for making this year another success. To the expert staff of John Good (CD), Rick Sheppe (scorer), and Fernando Silva (weather) – you are the best!!! Next year is the 25th Anniversary of the Senior Soaring Championship and we are planning an extra special event. See you in Florida next year!